When Will My Auto Insurance Pay For My Medical Bills? 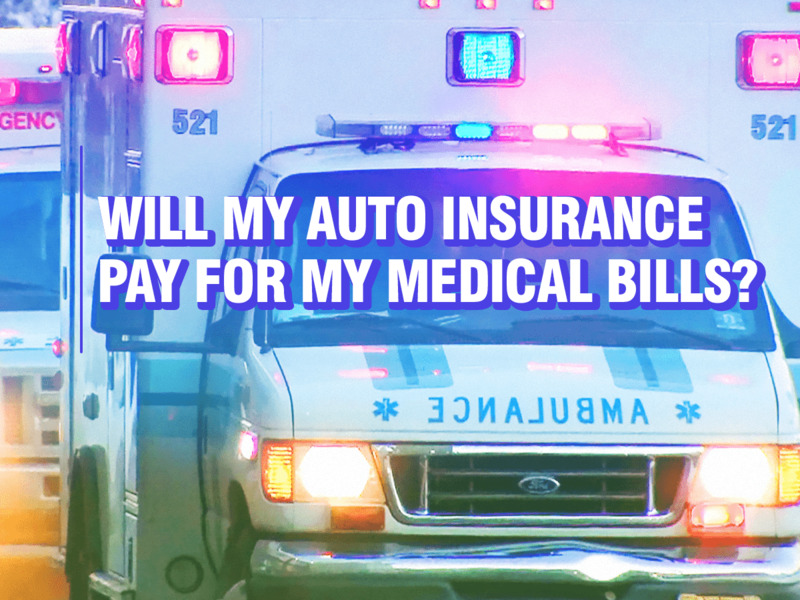 Home>Articles>Will My Auto Insurance Pay For My Medical Bills? Car accidents are responsible for a vast amount of bills in the United States. This can include damage that is physical to vehicles and properties, but can also include costly medical bills from people who are injured in an automobile accident. With the major expenses that can come from car accidents, having automobile insurance is extremely important. It is required to have a car insurance policy in almost all states, but it is essential to remember that automobile insurance at your state's minimum amounts might not cover everything that you needed to. It may be a smart plan, and often is, to get additional automobile insurance, depending on the state that you live in. Whether or not your car insurance plan will pay for your medical bills is dependent on a wide variety of factors. This includes things like who is at fault in the accident, the extent of the injuries caused by the crash, where the accident happened, and who was involved in an accident. Having this information will help you determine who is responsible for paying the bills. There are times when your automobile insurance provider might be responsible for covering the cost of your medical bills, and in other cases, the other driver's insurance company will be responsible for paying. There may be some cases where your medical bills will need to be covered out of your pocket. Because of this, you will want to select a car insurance policy that fits your needs the best and protects you from having to pay expensive medical bills on your own. There are different types of insurance coverages that you can get, and Med Pay is one of them. In almost all states, this type of insurance is not required and must be selected by the policyholder as an additional insurance type. Under this type of insurance policy, your medical expenses are covered regardless of who is at fault. Another important thing to consider when choosing whether or not to purchase Med Pay coverage, which is also called Medical Payments or MPC, is that most Med Pay policies have no deductible that needs to be paid to cover the medical attention that you receive after a car accident. This adds to the peace of mind that people can get from having a Medical Payments coverage policy. What Does Med Pay Cover? Med Pay covers most of the post-accident costs that are medical in nature. This includes a range of things such as ambulance expenses, emergency room fees, and expenses related to hospital stays, doctor visits, seeing specialists, diagnostics, and bills related to therapy needed because of the accident. While many people first learn about what their Magic Pay policy covers after being in an automobile accident, it is recommended to ask a number of questions while you are purchasing your plan, so you are aware of what it covers. You can also look over the terms of your policy for more information about what coverage you are receiving with the MPC policy. After finding out if everyone is ok, the expenses related to an automobile accident are one of the first things that are on people's minds after a crash. It is also vital to keep in mind that you can purchase different limits when it comes to Med Pay insurance. If your medical bills end up going over these limits, you may end up paying out-of-pocket for the remainder of the costs. Each state has different requirements for what automobile insurance companies can offer when it comes to Med Pay insurance. The range of what MPC covers can be quite vast. In addition to what is listed above, physical therapy, surgery, medication, and home medical care can also be included in your policy. Medical devices are also often covered. The only way to know precisely what your Medical Payment coverage helps pay for is to talk to your insurance company or look at your insurance policy thoroughly. What If My Med Pay Is Exhausted Or I Do Not Have Med Pay? There are many situations in which case your health insurance coverage will kick in if you still have medical expenses after your Med Pay is exhausted or if you do not have Med Pay at all. In these cases, you will be responsible for covering the cost of any deductibles or co-pays that are associated with your care, as if they were not accident related. Not all health insurance companies cover injuries due to automobile accidents, so you'll want to verify this with your insurance firm when selecting a health insurance policy. It can also be possible to hire a lawyer to sue the other party’s insurance provider to compel them to pay for bills related to the accident. Always compare insurance policies, looking at both the costs, the limits, and the differences between the plans you are considering. The purpose of Med Pay is to help make it easier for people who are injured in automobile accidents to get reimbursed for medical expenses. Having this type of insurance policy can provide considerable protection to your finances, health, and general well-being.